Recently my mom came to visit me in Nairobi for 10 days. I suggested that we spend some of that time at the Mara or on the coast, but she wanted to focus on exploring the city. We ended up having a great time, and I discovered a lot of fun new activities which I hadn’t previously known about. Aside from the inevitable expense of the flight to Kenya (because we didn’t find a good deal on Secret Flying), this was also a surprisingly affordable way to spend a holiday. With the exception of guided tours, most of the activities we tried had fees ranging from Ksh 50 / US$0.50 to Ksh 1000 / US$10 for one person. Taxis booked through Taxify are generally not more than Ksh 1000 / US$10 even for a long trip from the outer suburbs into town. Eating out can be expensive, but buying groceries and cooking for yourself is fairly cheap. Here are my top recommendations for visitors to the city! Nairobi is still very much shaped by its colonial-era urban planning. The city was founded as a railway depot in the late 1800s, and zoned into commercial and residential areas segregated by race. The northern and western suburbs were allocated to Europeans, and built up with single-family homes on wide, leafy streets, while the southern and eastern suburbs tend to have higher density housing or informal settlements. These patterns have persisted to the present day, with well-to-do Kenyans and white immigrants living in the former European colonial zones. Many visitors stay in these areas as well. It’s really not great to advocate continuing this pattern, but it’s also the case that many activities which might interest visitors are around these areas. Pick a neighborhood based on your plans in Nairobi. If you’re primarily interested in seeing wildlife, there are a number of good options for this around Karen, far to the west of downtown. If you’d like easy access to restaurants and shopping both in the neighborhood and in the central business district (CBD), consider Kilimani, which is immediately west of downtown. If you’d prefer peace and quiet, look for something around Gigiri, north of downtown. If you’re only passing through for a night on your way out to one of the national parks, it’s best to stay close to the airport in Embakasi, as traffic coming from the airport to any of these other areas can be quite heavy. The best way to stay is definitely with AirBnB. There are a number of great housing options available, and it’s almost always cheaper and more comfortable than a hotel. Start your trip with a panoramic view! The Nairobi National Museum just north of downtown has an excellent exhibit on Kenyan history — or you could go for a literal panorama from the helipad at the Kenya International Convention Centre in the CBD. Learn more about Kenyan arts and culture with a trip to one of the city’s many art galleries. The Nairobi Gallery is in the CBD, and the GoDown Arts Centre is just south of that. Farther out of town, past Gigiri, are a range of excellent galleries including One-Off Contemporary Art, Red Hill Art Gallery, and Banana Hill Art Gallery. Catch a concert, play, or spoken word performance at venues including the National Theatre, Alliance Française, or Goethe Institut, all of which are downtown. If you’re interested in traditional dance, don’t miss the daily shows at Bomas of Kenya near Karen, which feature dances from across the country’s 47 regions. The Nairobi Now newsletter is also a great resource for new performances. Stock up on souvenirs at one of the city’s many craft shops. The Maasai Market is held at various locations around town on different days. If you’re near Karen, stop by Langata Link Shops or Utamaduni Artisans, both of which have well made crafts. If you’re a more serious collector of African art, there are several interesting shops selling antiques and contemporary art at Village Market in Gigiri. There are lots of opportunities to get outside for hikes or picnics within the city limits, thanks to the work of environmental campaigners like Wangari Maathai. Karura Forest in Gigiri has miles of hiking trails. The Nairobi Arboretum near Kilimani is a lovely spot for a walk or a picnic. In Karen, Oloolua Nature Trail is a lovely place to spend an afternoon. If you’re passionate about wildlife, Nairobi is definitely the place for you. You can visit orphaned baby elephants at the David Sheldrick Wildlife Trust, feed a giraffe at the the Giraffe Centre, and or go on a half-day or full-day safari at Nairobi National Park, all of which are close to Karen. For the safari, you will need to drive through the park. It’s best to go with a tour guide for this, as they’ll be familiar with the places where animals usually gather. Check out TripAdvisor’s suggestions to find a guide. Don’t miss the chance to explore the beautiful countryside around Nairobi either. A drive out to Lake Naivasha will take you past the Rift Valley, where you can stop to appreciate the stunning view. You can also connect with your food by doing guided tours of Kiambethu Tea Farm, Brown’s Cheese Farm, or Fairview Coffee Estate, all of which are shortly outside Nairobi. Kenya’s unofficial national cuisine is nyama choma, or grilled meat. Every neighborhood has a good choma place, and it’s best to ask your host or just do a bit of Googling to find them. Two of my favorites are Peponi Springs in Spring Valley, somewhat north of the CBD, and the choma stalls at Kenyatta Market south of the CBD. A more upscale version of the same experience is provided by Nyama Mama in Westlands, west of the CBD. Ethiopian and Eritrean food are also well represented around Nairobi. Habesha in Kilimani has a lovely garden, and Asmara is a quiet spot in Spring Valley north of the CBD. Kesh Kesh in Kilimani is more of a café, but also serves excellent Eritrean food. There has been a large Indian population in Kenya ever since the colonial era, partly as a result of economic migration, and partly as a consequence of the colonial policy of bringing people from India as indentured laborers. Today, many prominent business owners in Kenya are of Indian descent — and there are also a lot of excellent Indian restaurants. Two of my favorites close to the CBD are Haandi and Chowpaty. In Karen, Open House is quite good. Other international foods are also quite well represented. I’m fond of Mercado (excellent Mexican close to the CBD), Caffe Concerto (a tiny, outstanding Italian place in a converted house in Kilimani), and Misono (sushi in Kilimani). If you’d rather cook for yourself, every major mall has a good supermarket. In Kilimani, you can choose between two Kenyan supermarkets: Nakumatt at Prestige Plaza (which is well-stocked, unlike its sad situation last year) and Chandarana at AdLife Plaza (identical selection to the Chandarana across the street at Yaya Centre, and much less crowded). In Gigiri, there’s a Zucchini greengrocer at Village Market. In Karen, there’s a massive Carrefour at the Hub. It’s also easy to get takeaway through Jumia Food, which does delivery from a wide range of restaurants throughout the city. Most nationalities need visas to enter Kenya. Apply for an e-visa before you leave, and take the printed approval form to passport control on arrival. The vast majority of Kenyans are on one mobile network: Safaricom. Get a SIM when you arrive, and don’t forget to sign up for mobile money with MPesa. Every merchant accepts it, and it’s much easier than carrying around cash. If you have an American, Canadian or British bank account, you can use Wave to easily transfer money to your MPesa account. Within the city, use Taxify to get a taxi from door to door, SafeBoda if you’d rather hop on a motorcycle and beat traffic, and Ma3Route (pronounced “matatu route”) if you’re not in a rush and would rather take the bus (a.k.a. a matatu). Malaria incidence is quite low within Nairobi, and you don’t need to take anti-malarials. You will be asked for proof of a yellow fever vaccine at immigration, however. If you need medical care while you’re here, there are pharmacists / chemists at every major mall. The Nairobi Hospital near Kilimani and Aga Khan Hospital in Parklands near the CBD both provide good care. You can call St John Ambulance for transport at +254 203 340 262. I’ve spent a few fun weekends in Kampala and Jinja this year. Here are some favorite photos. As always, more photos are on Flickr and Instagram. 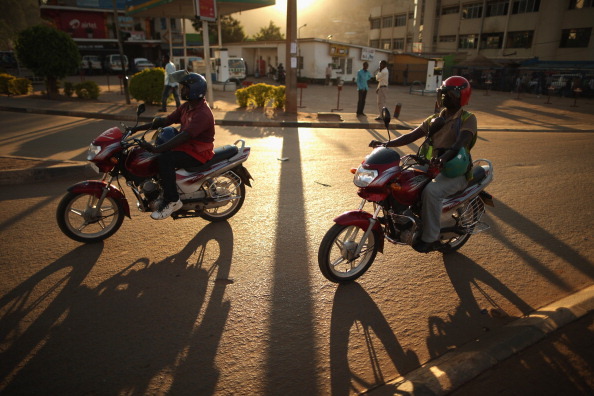 A few photos from a recent work trip to Kigali. Looking forward to spending more time in Rwanda now that I’m back in the region! The major innovation of this trip to Ghana (at least for me) has been my commute. I’ve been zipping around Accra on a Yamaha Crypton, which has been fantastic. In cities with heavy congestion and limited infrastructure, motorcycles offer a commuting option that’s cheap, fast and versatile. They’re good for cutting through stalled traffic, or navigating unpaved roads with ease. They offer a great chance to explore areas that couldn’t otherwise be easily reached with public transportation. And sometimes you just want to drive along the road by Labadi Beach with the salt wind in your face. In short, very fun and highly recommended. That said, learning to drive a motorcycle well enough to to do safely in Accra required a substantial amount of up-front investment. Here are some tips for getting started with a motorcycle and learning to ride safely in urban traffic. I don’t mean the volume of them to sound discouraging, but there is real risk to riding a motorcycle, and if you can’t commit to doing it as safely as possible, then you shouldn’t do it. Spend a few weeks as a bike commuter. No bike lanes allowed! Riding a bicycle is the best way to prepare for handling a motorcycle at low speeds, which is mostly what you’ll encounter in traffic-plagued cities like Accra. You’ll also need to get used to being in close proximity to cars. Get a new motorcycle. The used motorcycle market here is large, cheap, and full of lemons. You do not need your mirrors to fall off at the first pothole you hit. I bought a new moto from a dealership here for about $1300, and expect to recoup most of that cost when I sell it at the end of my next research trip. Get geared up. A helmet is non-negotiable. For preference, you should also wear close-toed shoes (or ideally over-the-ankle boots), jeans, a jacket and gloves. An armored jacket is ideal, but at minimum you should do a durable raincoat or denim jacket. All of this can be rather hot if you’re stopped in the sun, but as long as you’re moving I’ve found it to be quite comfortable. Find a safe place to practice. It took me at least a month of daily commuting on quiet back streets before I felt like I had an intuitive sense of how to handle the moto. It’s essential that you find a safe place to practice until you reach this point. If you have to consciously think about how to turn, swerve, or stop, it will be difficult to respond rapidly enough to all the challenges you’ll encounter in places like Accra. Obey the traffic laws, but don’t expect that others will. I would say that 75% of drivers here follow the laws fairly well, with the exception of small things like failing to signal turns or stop completely at intersections. The worst offenders by far are other motorcyclists, who have all collectively decided that they are bound by neither law nor physics and drive in a manner which reflects this. I spend more time scanning for motorcycles than any other type of traffic, since the erstwhile advantages of being small and fast make it difficult to see them in advance and respond quickly to any unpredictable behavior. Don’t outride your brakes. Or, put differently: you always need to try to identify a safe path forward, and be prepared to stop if you can’t find it. Even if you’re on a well-lit road with limited traffic and a clear line of sight, it’s difficult to predict what you might find ahead of you — uneven pavement, a pedestrian dashing across the street, a turn that comes up more rapidly than you expected. Drive more slowly than you’d like to, particularly if it’s your first time on a certain road. Be extremely careful at night. I’ve driven several thousand kilometers in a wide range of conditions, and am confident in my ability to handle most driving challenges. I still actively limit the amount of time I spend driving at night in Accra because of the high levels of risk involved. Take all the issues outlined above, add a lack of street lights and the problem of having opposing cars’ headlights constantly in your eyes, and an accident becomes a question of “when” rather than “if.” If you are going to drive at night, stick to well-lit routes and drive even more defensively than normal. In short: be safe and have fun! I’ve written previously about my penchant for managing long trips in low income countries with only a carry-on, and I’m continually refining my methods for this. Here’s my current list of essentials. Some of the luggage in particular is rather expensive, but it’s always worth paying more up front if you can. This travel strategy means that you’ll be using all of your bags and clothing more intensely than you likely would at home, and cheap items will wear out more quickly. Drawstring bags for organizing shoes and small items of clothing, and a jewelry roll, which can also double as storage for pens, small electronics, extra SIM cards, etc. What else is on your travel must-have list?